We’ve been told the road to hell is paved with good intentions, but all English majors know the road to hell is paved with statistics, and the Pride Institute would agree. The Pride Institute tells us that members of the GLBTQ community are more likely than non-gays to struggle with alcohol and drug addiction and less likely than non-gays to seek help once they do. And the statistics are even more dire when talking about queer youth. The problem, ultimately, is a feeling of emotional disconnection from others, and this disconnection can drive members of the GLBTQ community to drink, literally. Fortunately, this disconnection can be undone by one of Twin Cities Pride’s 2016 Community Champions of Pride: Out & Sober Minnesota. Fun serves as Out & Sober Minnesota’s core, but the group came into being to address a dreadful problem that first reared its head in the era of MTV and Ronald Reagan. “In 1984, many twelve-step recovery groups did not accept LGBTQ people,” Champion recalls. So in that year, the Twin Cities Gay and Lesbian Roundup was born; it was intended as safe haven for GLBTQ addicts who had been deflected by Alcoholics Anonymous. This inclusion becomes obvious to members who engage in Out & Sober Minnesota’s social events, which run the full gamut of yin and yang. Recent examples are a meditation workshop (an introduction to the inner workings of inner peace), snow-tubing (an introduction to the outer workings of winter gravity), and Spring Fling (an event designed to match sponsors with sponsees via an unlikely Dating Game format). “If people do not have fun, make friends, or feel like they are part of something, it is hard to maintain long term recovery,” Champion assures. That support will be on full display with Out & Sober Minnesota’s participation in this year’s Pride festival. Reports Champion, “This is our second year as participants in the Pride parade as well as the Pride festival. This has become one of our biggest events.” In fact, Pride represents a kind of meta-event that allows Out & Sober Minnesota to discuss its other events with the general public. “We love having a booth in the park,” Champion enthuses. “We use this as an outreach opportunity. We have volunteers from the LGBTQ recovery community staff the booth and talk about their experiences with recovery and let people know about our activities. 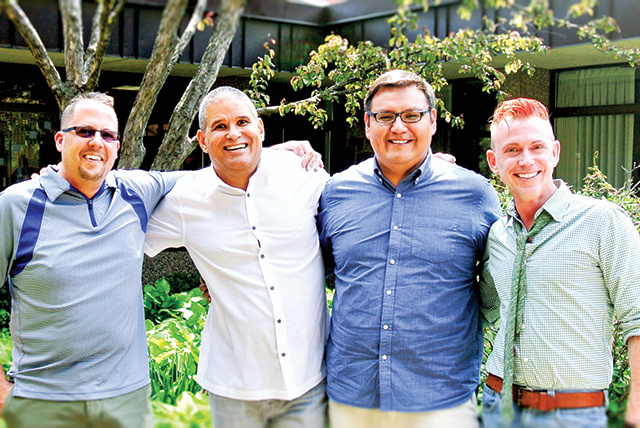 One of our goals is to reach out to all members of the LGBTQ recovery community, or those considering recovery, and let them know they are welcome here.” In other words, Out & Sober Minnesota’s outreach represents another form of reconnection. Congratulations to Kevin & our friends at Out & Sober MN on doing such a great job! We are grateful to have you as partners in the Recovery community. Thanks for all you do to help others learn to have *fun* I n Recovery. Your friends at the PRIDE Institute.